I am a total sucker when it comes to YA dystopias. I love the naivety. I love the angst. I love the revolutionary spirit. I love the sense of betrayal when everything about the characters world falls apart. And most of all, I love the determination to rebuild. It’s beautiful and Eve has all of that. I adored Eve’s goody-goody/nerdy personality. I immediately felt a connection to her, since I would have reacted in many of the same ways when I was that age. She is so trusting and so innocent. Yet, her absolute determination to rise above the society that controls her is inspiring. I loved Caleb and his patience with Eve as she struggles to navigate and come to grips with this suddenly transformed world. I loved the relationship Eve has with Arden as well. 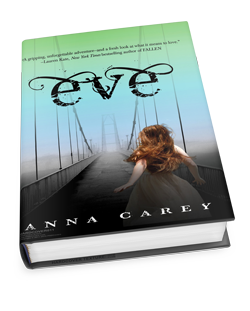 Arden is hardened and knows more about the world than Eve does. At first they are practically enemies but by the end, a mutual respect and friendship has been formed. The world and plot building was lovely and really the only problem I had with the novel was the ending (a little overly dramatic, in my opinion) and the sort of unbelievability of certain aspects (for example, why would a government invest so much in educating and sustaining girls if their only purpose is to be baby machines? Why wait until they are 18 when girls typically reach sexual maturity much earlier?). Despite these few concerns, Eve was a thoroughly enjoyable and totally fun read! Action-packed and thrilling from start to finish, I’m excited to see what happens next!